Included in the box is the projector itself, a 6-ft long power cable, a remote and an RGB input cable. Build quality between these cheap projectors is largely similar so if you’re comparing this to other options you won’t do better. It’s all plastic and kinda hollow feeling, though the plastic does fit together solidly. The legs don’t extend at all. Instead you get this little flap on the bottom as a very basic adjustment. The projector also does offer a slight tilt adjustment that’s only really useful if you’re hanging it upside down. If you’re going to have it right side up, use a small tripod and the tripod screw on the bottom. In terms of actual projection quality, there are a few things to keep in mind. First, you’ll need to use this in a pitch black room. Daytime use is basically a no go as any ambient light more or less drowns out the projection. But assuming you have a dark room this projector has decent picture quality overall. The increase in resolution versus other cheap projectors is pretty noticeable especially when it comes to things like browsing web pages with text. The projector works surprisingly well for bright movies and content such as anime and cartoons. By default the colour settings are a way too overstated but with some adjustment the colours it can reproduce are accurate and detailed. Don’t be too heavy handed on any slider or it’ll severely wash out colours and detail. Dark footage like Game of Thrones or other dramas do not work as well as bright and colourful footage does, but are still watchable. There is a built in speaker that is actually relatively good for the price bracket. Now it’s not going to blow you away like the fan noise does but dialogue from it is clear. It just lacks punchy bass. For extended watching I would recommend an external speaker, but in a pinch this does the trick. Unfortunately, the headphone output on my projector was also a problem. The audio that comes out of the headphone jack is literally unusable, with a constant high pitched feedback in the background. The best option is to use the audio output on your source device instead. All of the issues mentioned so far are relatively small and common at this price point. The flexibility and brightness are trade-offs of almost all budget projectors. But there is one thing that is not great about this projector: the fan noise. It is so darn loud. Using a headset or good speakers at a reasonable volume will drown it out, but this is about the maximum volume acceptable for a projector fan. On a whole this is a basic projector. It turns on and displays images and that’s about it. In order to meet the $100 price point the C80 forgoes a few features: there is no wireless display. There’s only 1 HDMI port. The operating system has few settings. Ideal projecting distance with this is between 6 and 8 feet. You can go further away but it’ll get too big and dim. There’s no zoom so you’re stuck moving the projector back and forward to get the size you want. As with other cheap projectors it can be tough to get the entire image in perfect focus but in the end the quality of projection will all come down to your specific room and how the projector is mounted. Even a slight ambient light will drown out the projector. This projector is only for use in a totally dark room. 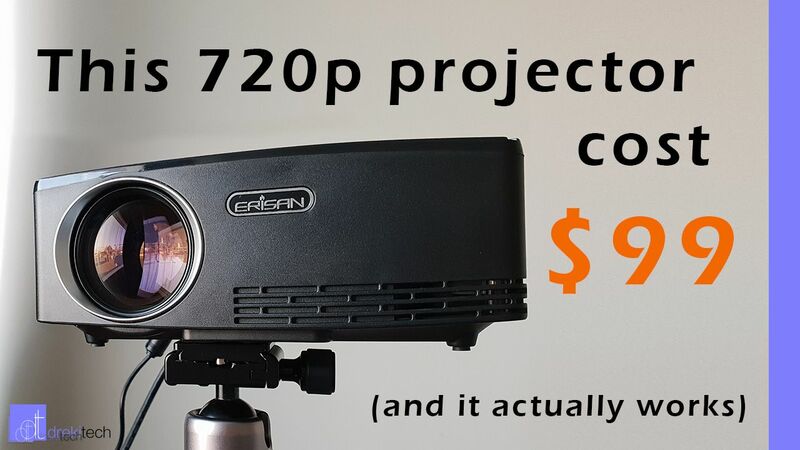 Overall, this is the budget projector to get if you care most about resolution, and I figure it’s one of the better options under $100. The image quality is a significant step up from most 480p projectors, and even though it lacks features like wireless display, on many other cheap projectors that’s just a gimmick anyways. Use it in a totally dark room and it does fine, especially considering the price.